Stockholm, bright with Baltic sun and urban rock, has been bannered with posters heralding the Moderna Museet’s current exhibition, “Hilma af Klint: A Pioneer of Abstraction”. This show is at once a debut and a second coming for a most intriguing and secretive twentieth century painter. 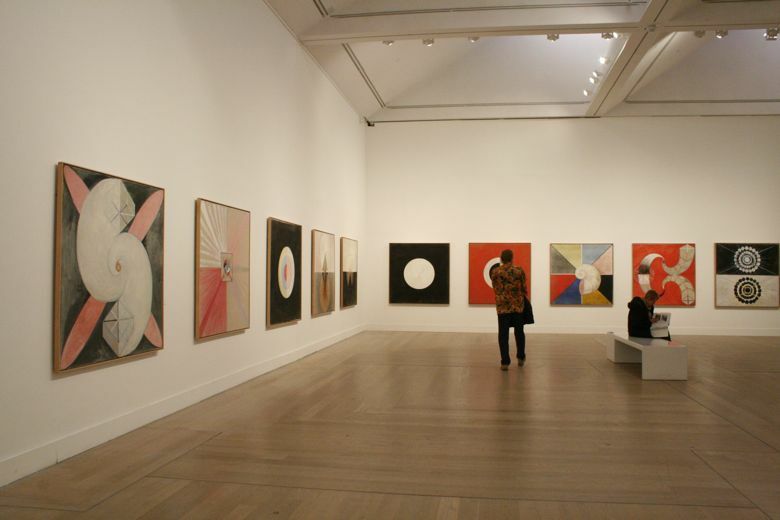 Sprung from tomb to spotlight, her name emblazoned against a gallery wall in mauve fading into bright yellow like a rising sun, the message is clear: Hilma af Klint’s (1862-1944) moment in art history has arrived. Af Klint’s early and outward art life was rather conventional, or as conventional as could be for a single woman working as an artist at the turn of the twentieth century. Prim and buttoned in appearance, she was, behind the heavy curtains of séance rooms, a mystic, a medium and a radical painter. Born in Stockholm, af Klint gravitated towards mathematics and art in her youth and pursued formal art training at the Royal Academy of Fine Arts, graduating in 1887. She was granted a studio in the city centre where she worked publicly for nearly 10 years, producing portraiture and landscapes in a naturalistic style. But all the while she was cultivating a complex inner life and new modes of painting to convey these searchings to a select group. Modes so new that curator Iris Müller-Westermann asserts with a persuasive didactic that af Klint is an important abstract artist. 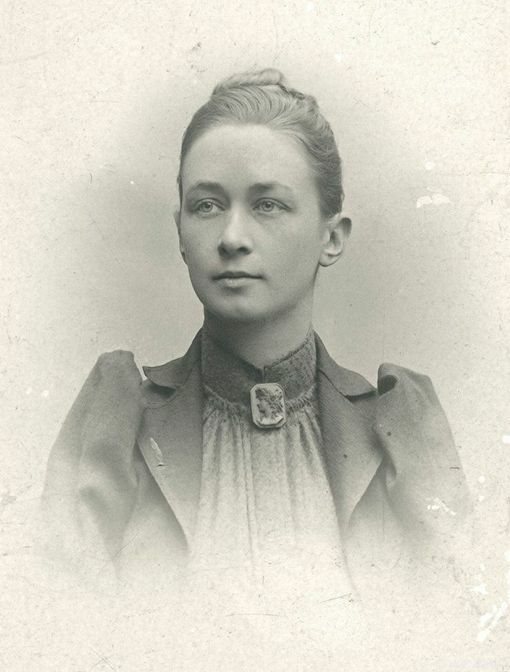 Af Klint attended her first séance in the 1870s and soon became a fixture at spiritual meetings concerned with Spiritualism (the belief that the dead can be contacted through a medium), Theosophy (empirical investigations of divinity) and Anthroposophy (the pursuit of spiritual knowledge through explorations of the imagination and sensory experiences). The results are a sharp departure from the figurative, representational and academic style of her training. She began to paint in vivid colour, on expansive canvasses, with playful motifs, eventually using an invented symbology she meticulously mapped in her journals. This hidden body of work is vast- af Klint’s oeuvre is prolific, some 1000 drawings, paintings and watercolours. The pieces are alarmingly modern and show a style that shifted often. 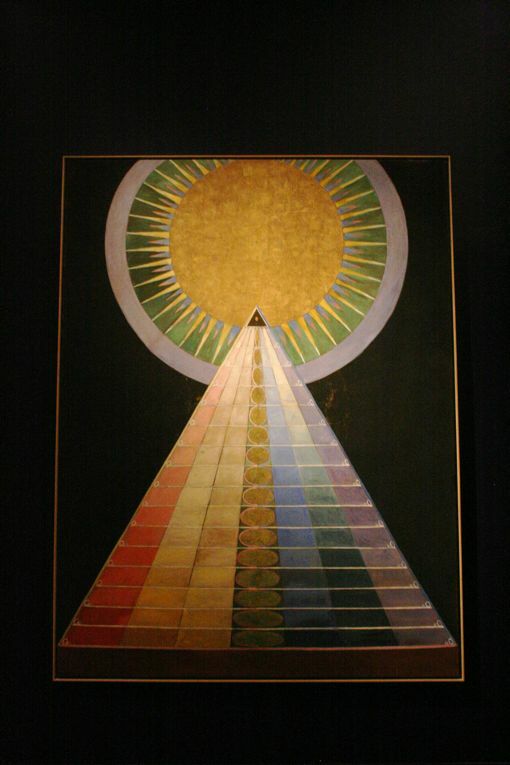 Af Klint painted in series – Paintings for the Temple, The Parsifal, The Altarpieces – creating a taxonomy of the elements of her visual logic. Some canvasses are ordered and geometric; some tend to concepts of balance, ying and yang; and there are watercolours that swirl and tunnel towards, perhaps, the “world beyond the visible”. Many look very current. Startlingly so. 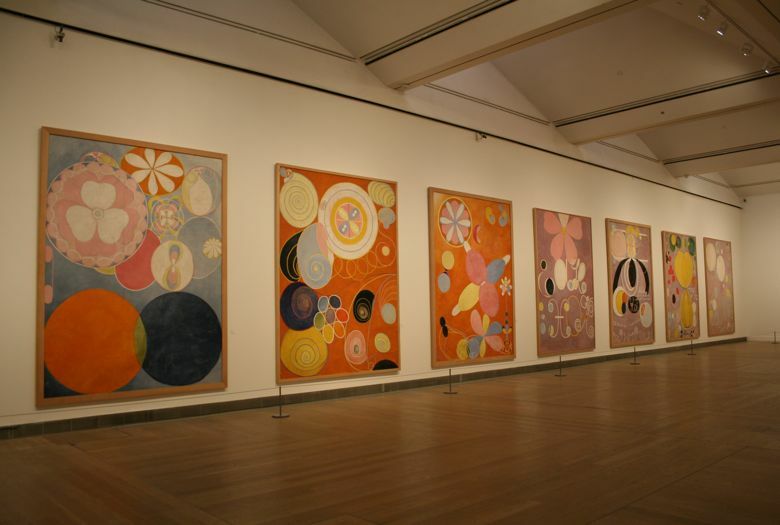 None of these abstract canvasses were seen publicly during her lifetime and it wasn’t until the 1980s, forty-odd years after her death, that af Klint gained introduction to those concerned with the canon of modern art. 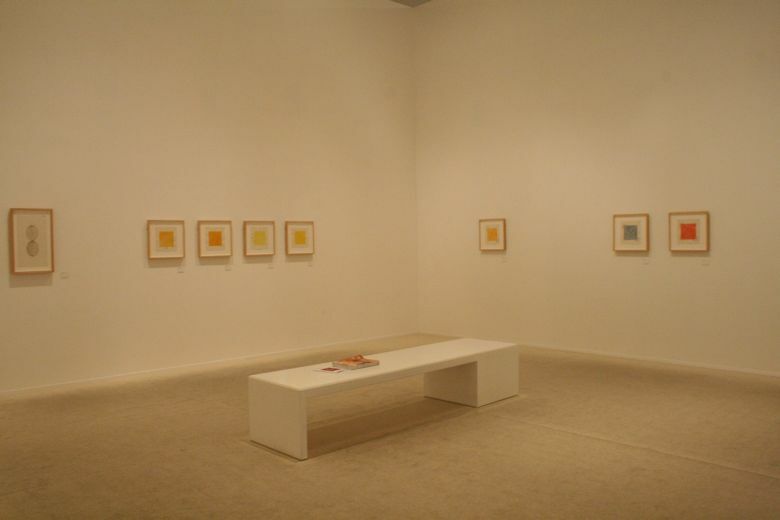 The shroud of silence surrounding her abstract paintings was very much by her own design. Af Klint left her artistic legacy with strict instructions; her will stipulated her abstract art remain unseen until twenty years after her death. Müller-Westermann situates af Klint in the company of Russian and European abstractionists, like Wassily Kandinsky (1866-1944), Piet Mondrian (1872-1944) and Kazimir Malevich (1878-1935). 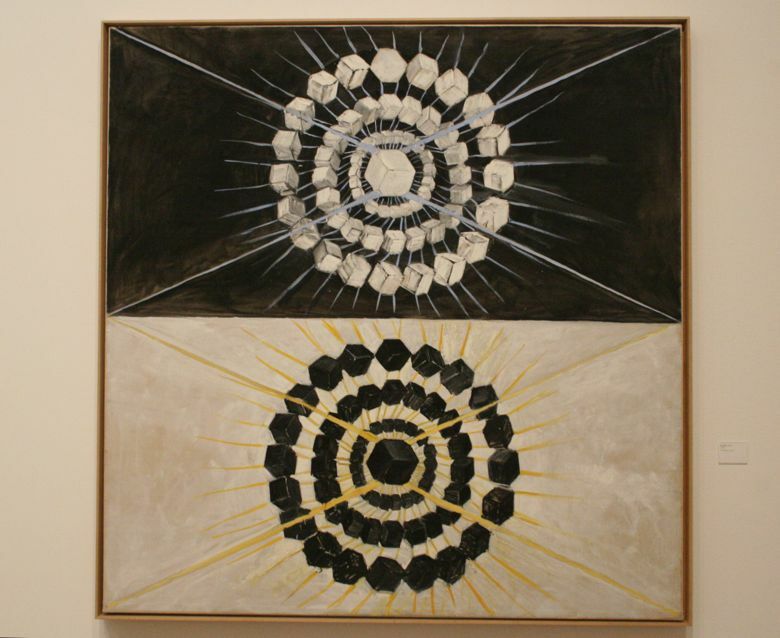 There are clear visual correlations, but while these architects of abstract art showed their work, af Klint painted in isolation from the European art world. And she did so producing abstract works five, ten years before these artists. Recently, af Klint was conspicuously excluded from New York’s MOMA exhibition “Inventing Abstraction, 1910 – 1925.” Should invention be a race of time, af Klint won, producing abstract works before other abstractionists, however, where the art market and history makers are concerned, she does not register – she did not show and sell, thus she is not an important artist to collect, (perhaps, until now). A second, more disconcerting reason for excluding af Klint from the conversation about the development of abstract art has to do with her occult practices. Af Klint’s commitment to art was lifelong, she painted prodigiously until 1941, and while abstract artists placed in her company by Müller-Westermann also explored spiritual philosophies, hers appeared to be the driving force of her entire body of work. Af Klint believed no audience was ready for her paintings during her lifetime or within 20 years of its end. Still, today, dialogue about the spiritual in art is clumsy and beliefs tending towards the occult are widely classified as wacky claptrap. Müller-Westermann makes a point to tie af Klint’s interest in parallel worlds to science as well as spirituality, suggesting af Klint drew inspiration from turn of the century discoveries like x-rays, electromagnetics, the atom and the theory of evolution. 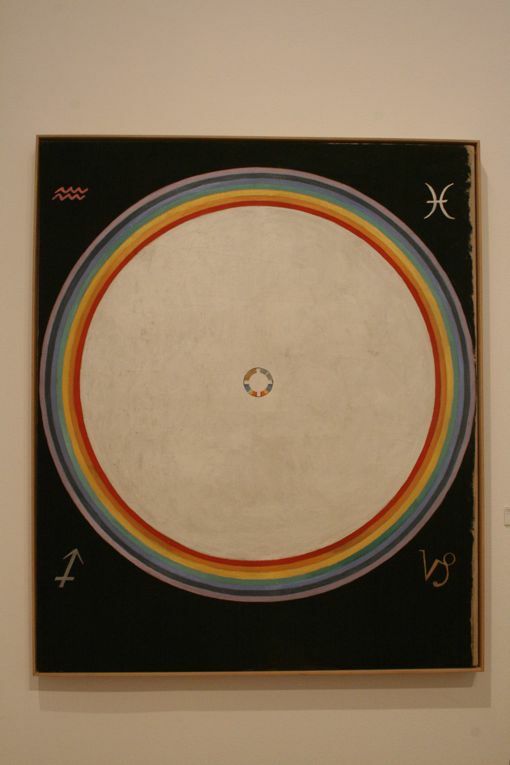 Supposing that af Klint aimed to give form to what exists but is unseen, science may be a more palatable explanation for her vanguard art to a contemporary audience than her occult practices. Müller-Westermann does include af Klint’s spookier pieces, one, a drawing that ominously portrays a map of Europe blowing licks of flame toward England titled A Map/The Blitz, 1932. Mention of af Klint’s spiritualist practices and presumed contact with the dead is left decidedly vague throughout the exhibition; the art is exciting independent of a clairvoyant narrative. What is obvious to the viewer is that af Klint’s artistic impulse towards abstraction was steady and assured well before the spirit moved other artists similarly, so to speak. If af Klint painted for the future, we can be grateful to be in her audience. 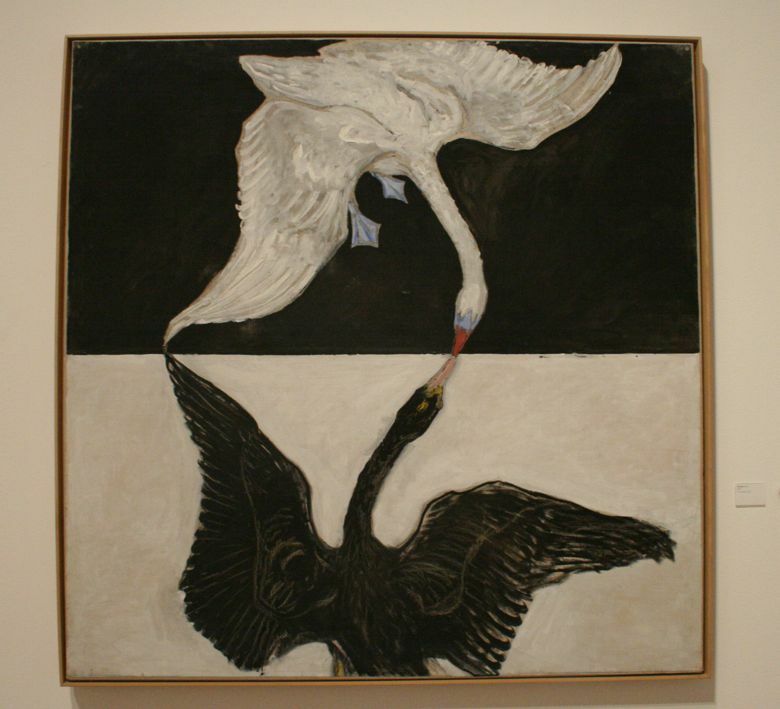 Now, nearly seventy years after her death, Hilma af Klint is causing quite a stir in Stockholm that will, no doubt, spiral outwards and beyond. Thank you so much for this fascinating post! 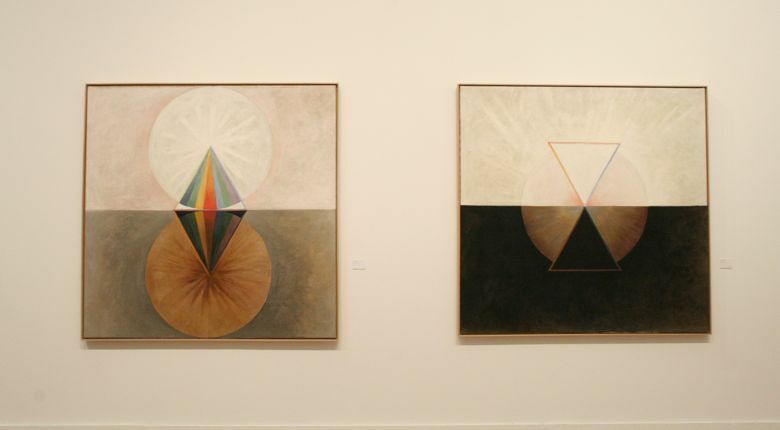 A few years ago at the Institut Suédois in Paris there was an exhibition of some of Af Klint's works, which was my first introduction to this artist and her work and I was very impressed. I hope that you are right and that the time has come for her to be more well-known. Anyway, this post has really brightened my day. Thanks again!